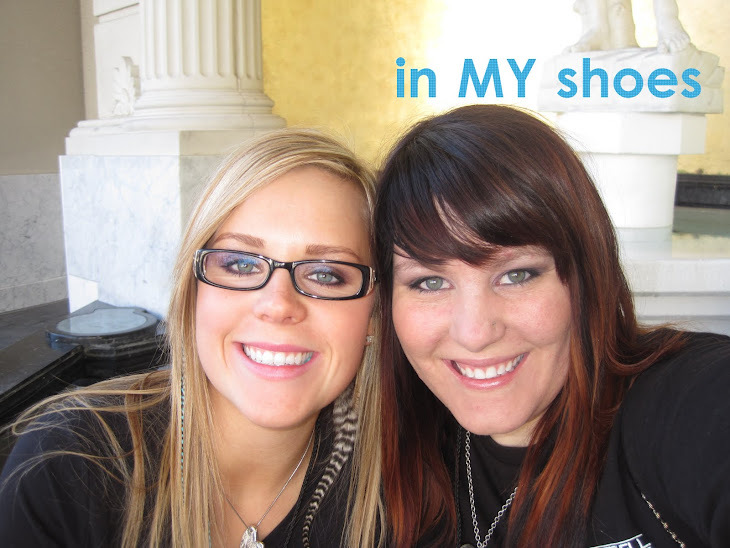 in my Shoes: Our NEW Home! I have plenty of projects to keep me busy while I'm not doing something Paul Mitchell related! As I said in my last post, there is A TON of painting that needs to be done! 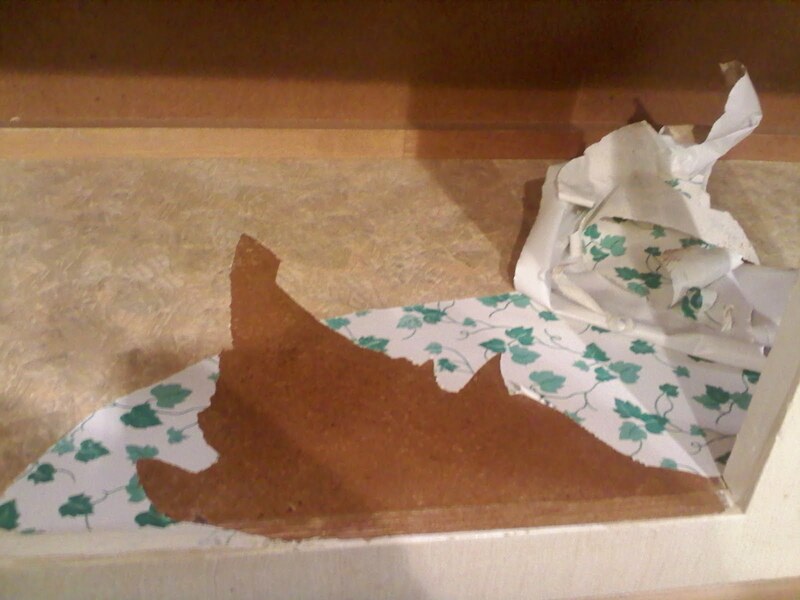 I also worked on ripping out all the contact paper from inside every drawer and cabinet in the place!! It left a little sticky so I put that self adhesive non slip stuff down in its place. I love that under the fancy "i can't decide if i am a faux wood or slightly leafy pattern" was a lovely white with green ivy print, it reminded me of my aunt Shelly circa like 1998ish! The actual wood below, for the most part, is in really good condition. 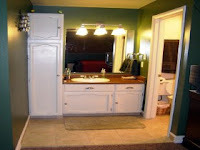 I'm still thinking about what will happen with all that wonderful cabinetry...pretty sure i'll just re-paint it. But not before a nice sanding takes place!! They look like they have 30 years of paint on them, oh wait.. they do! I have nearly finished the bedroom area. 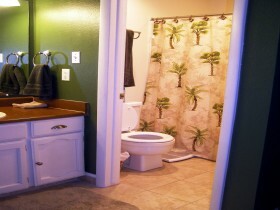 The shower/toilet area is all finished (including the trim) and it looks GREAT!! 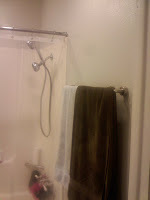 I also bought a new shower head for the shower and to assist me in coloring hair, should I ever need it.. I really like it, but the water pressure in this place is HORRIBLE!! It's not just the double shower head that makes it that way either... I'm going to have to investigate things to help it. 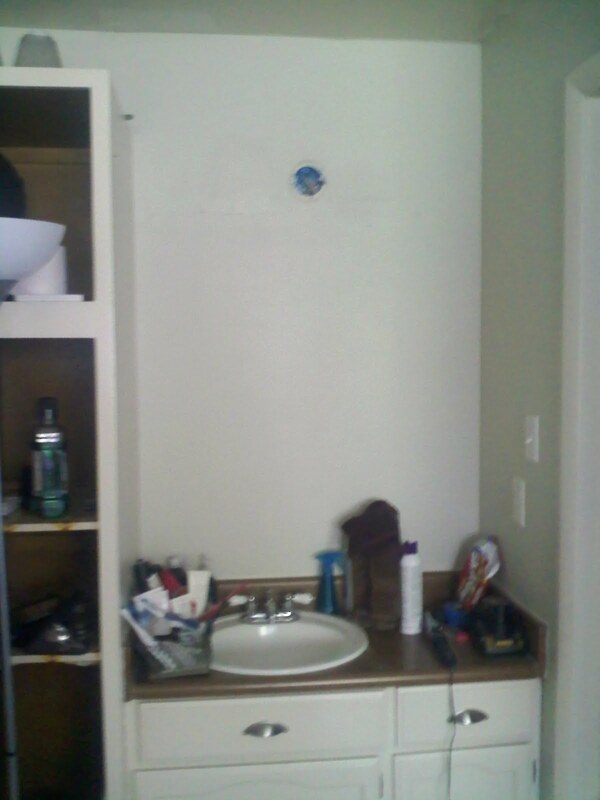 Oh, and that lovely three sconce light fixture above the mirror is no longer.. it turns out when you can't get it to be straight, you should stop and take a break instead of just unscrewing it and screwing it back on a bunch of times until the wire inside snaps and it's no longer useful. You can't really tell but they had the towel rack above the toilet which I think is a waste of wall space so I moved it! 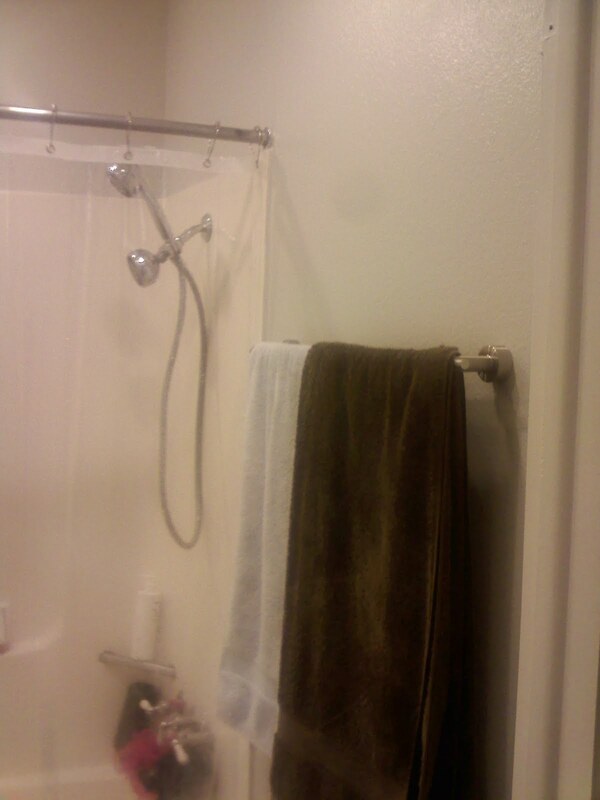 The last picture was taken inside the shower room before I put the door back on. I LOVE the contract in the paint that Wendy McKenney picked out for me! Friday I put the door back on the shower room after 2 weeks without it, and i HATE it!! 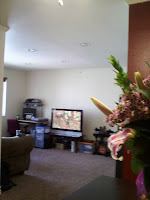 I am going to have to look into alternative options that are simple to install but still allow privacy. It was very nice of the previous owners to update the hardware on the bathroom cabinets but I hated it. I am so glad they didn't feel the need to put it on all the kitchen ones too!! I filled in the holes that the hardware left and when I paint the cabinets, no one will ever know that they were once there! 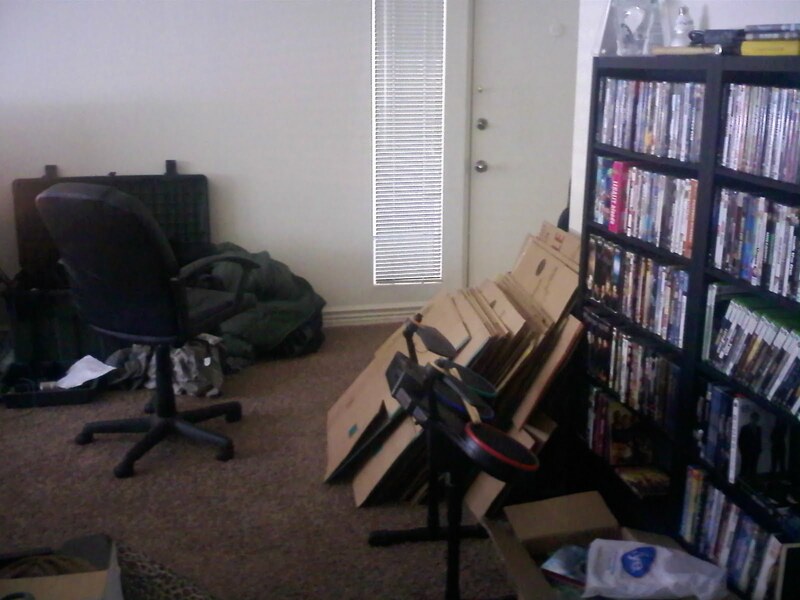 Now the bedroom looks like a completely different place than the before picture. 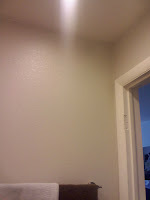 I haven't quite finished the ceiling and such but when I do, I will then retake the picture at night time for a better comparison to the before shot.. but here's what it looks like now!! 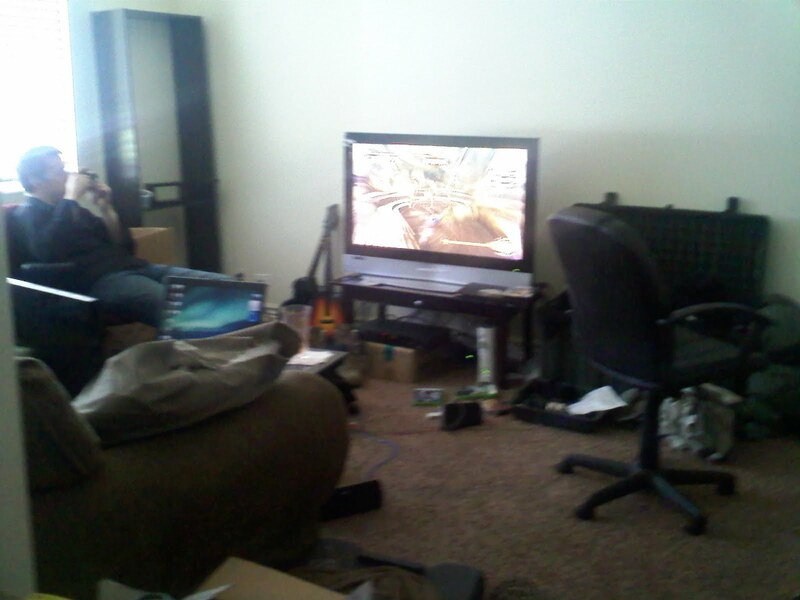 We don't have any furniture in the bedroom yet. We will be getting a low profile bed frame and some side tables to go with it. Since we won't need to put a dresser out in the bedroom (cause i am tearing out the wall in the closet, taking off those AWFUL mirror doors (they will get a second life don't worry, you'll see) and building in a closet organizer... let's just be honest...BUYING a closet organizer and putting it together/placing it in the closet) i think that i will also be getting a sofa-like table to go against the wall to the left of the bed. For like my jewelry boxes and maybe sometimes my laptop.. 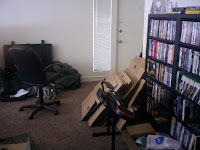 Here is a little glance at what the living room looks like now.. MAN, if I would just update this thing more often, i wouldn't have to cram so many things in one BLOG!! I apologize for the crappy phone pics, but I generally have my phone on me at all times! And although my camera is with me wherever my purse is... if I don't stop what I am doing and get it out to take a picture, I get distracted and 3 days later.... well you get the idea!! We still need to pick out a paint for the walls and hang up the TV. The TV part should happen this week! Oh and about that small Facebook post about painting the blinds... it was SUCH a good idea until we got them hung up in the living room and realized that they are just a foot too short for the window. 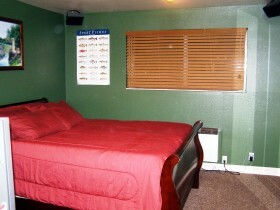 I found a great place online last night that makes custom blinds for super cheap! I ordered ones for the big window and also ones for the little guy next to the front door. I'll get some pictures taken now so that I don't have to use my phone right before I rip them down. I LOVE THEM!! It's amazing what the settings alone on your camera are capable of, when most of us just turn it on AUTO cause "that should detect the best settings...right?" Sunset mode did all this for me! Happy Anniversary Adam!! Thanks for the 4 best years!! It already looks so much better! I was thinking about your bathroom door situation. I absolutely love this http://whisperwoodcottage.blogspot.com/2010/03/sytycd-week-3-project-oldbarn-style.html as an alternative to a pocket door (which sadly probably isn't possibly due to the electrical stuff in that wall). I think the exposed tracks are so cool. You could also pick a more modern door and it could look pretty sleek. 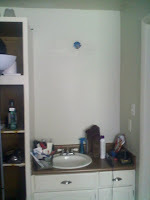 I'm just not sure if the wall even has enough space to accommodate it... do some measuring! Thanks HipHouseGirl, I Love that idea!! I will be looking further into it and i'll keep you posted! !